There is a new book on FreeSWITCH 1.0.6 that is to be published in July 2010 by Packt Publishing. I’m looking forward to reading it. I bought an Acer DX900 Smartphone last September without actually trying one out first. That was a big mistake. The phone’s specification is impressive but it’s the dual SIM card capability that I really needed. I had a look at some Samsung Duos models and they were very good, but none of them at that time had WLAN. It wasn’t long before I started to discover how less than half baked the DX900 is, and how dissapointing Acer’s support can be. The Product Manager for this model is non existent. After more than seven months of use, I am now ready to accept that I was exceptionally stupid to buy this phone without trying it first. I am stuck with it now for at least another year or more. Having to pull the battery out every day to restart the phone after it crashes is becoming very tiresome. (1) Never knowingly buy anything made by Acer. (2) Never buy a phone that has a Microsoft Operating System. I use various Comodo tools to protect my Windows based computers. One service offering that I noticed recently was their Secure DNS that provides an alternative to the DNS provided by my ISP. Making the change is straight forward in DHCP or resolver configuration. If you need instructions they can be found here. These instructions have been written specifically for installing MythWeb on an Ubuntu 9.10 host. Build an Apache2 web host in the DMZ and setup password login using .htaccess in the web server’s document root. Use individual user ID’s and a group called ‘authorised-users’ to control access to the server. See htpasswd. Test that the security works from a friend’s computer with internet access. The default installation for MythWeb is directly on the MythTV host backend. There is no easy installation option for installing MythWeb on another host. However, it is possible to checkout MythWeb individually from SVN and install manually which is the approach I am taking. Install Subversion if not already installed. This will create a subdirectory /var/www/mythweb containing the MythWeb software. Determine the user currently running Apache as this information will be required to set access to the MythWeb data. This should display a list of user ID’s running Apache. The most frequently occurring ID is the one to use. So, www-data is the user running Apache on my system. Create a subdirectory to hold TV Channel icons instead of storing them in User’s home directories. Copy the sample Apache configuration file to the additional configuration directory ‘sites-available’. Edit the file using your favourite text editor and make the following changes. # to media players that don't work with authenticated servers. # CHANGE THESE PATHS TO MATCH YOUR MYTHWEB INSTALLATION DIRECTORY! e.g. # to suit your authentication needs. Change the value for db_server from ‘localhost’ to the hostname of the MythTV Backend with the MySQL database. Ensure that the MythWeb host can resolve the hostname that you use. Edit /etc/hosts to include a valid entry for the backend if it can’t. # a different server from your main backend. Make sure you have mod_env enabled. Change the email address to receive error alerts on to one that you currently use. # uncomment and set the email address below. # enable mod_headers by default, but I recommend that you enable it. The MythWeb host in the DMZ will not have direct access to MySQL on the MythTV backend. The firewall will be blocking communication from the DMZ to the inside network. You need to open up ‘pin holes’ in the firewall to permit access from MythWeb to MythTV on ports 3306, 6543 and 6544. I created rules for TCP and UDP until I can test which are required. I suspect only TCP is required. MySQL on the MythTV backend also needs to be reconfigured to allow access from remote hosts. Edit the file /etc/mysql/my.cnf and change the bind_address from 127.0.0.1 to the IP address of the MythTV host. Playing Flash Videos from the ‘Recorded Programs’ results in an error ‘Netstream not found’ this is most likely due to a problem with the firewall blocking the traffic between the browser and the server. Fortunately, Adobe have a very handy web page that tests the connection capability with their Flash Media Server that can be used to help diagnose the problem. Create a firewall rule to allow port 1935 (macromedia-fcs) Real Time Messaging Protocol (RTMP) between MythWeb and MythTV. I have been using a Linksys WAG200G as a wireless access point since December 2007. I’m not using it for my broadband connection as I have a separate firewall and router already on my network. It has been running reliably without any problems since installed and it occurred to me that it had been some time since I had used the device’s administration page or reviewed Cisco’s patch history for it. Using the web interface, the installed firmware was shown to be version 1.0.9, which was some way behind the current 1.1.9 release. I couldn’t find the release notes for any versions prior to 1.1.5 so I decided to upgrade the firmware to be certain that any known vulnerabilities had been patched. After exploring the device’s web interface, I remembered that the little router supported SNMP. I didn’t have a NMS when it was installed so I had left this feature unconfigured. Now that I have a Nagios console it was time to activate the SNMP management. I set the device name to the same name that it’s IP resolves to in my DNS (wap101). I then set the monitoring IP address and trap target address to that of my NMS. Finally, I set the read community to public, and the write community to private. My Linksys uses 192.168.1.30 for it’s Ethernet interface. Change it to your device’s IP address if you are going to try it yourself. Redirecting the output to a file is useful for future reference. I found that Nagios doesn’t like non-unique service descriptions, which is why my descriptions take the form shown above. Click here to view my Host and Services Definitions for the WAG200G. I used the documentation on check_snmp to prevent critical warnings for zero values (-c 0). In time, if any of my services start seeing errors I can change them to use a warning range and a critical range instead. My Ubuntu 9.10 package install of Nagios was missing the command snmp_check. I added the following code to the bottom of my /etc/nagios-plugins/config/snmp.cfg to get SNMP working as the vital command was missing for some reason. My two recently acquired Dell GX240 PCs were surprisingly quick with the 1.6Ghz Pentium 4 processors and Ubuntu. However, after some research I discovered that the GX240 motherboard is capable of using a more powerful processor without having to change to faster RAM. A quick search on eBay located two used SL6VV (2.6Ghz Celeron) processors for £3.95 each (including postage!) and they were promptly purchased. The upgrade itself is very easy. Simply open the case, flip up the green heat-sink shroud and unclip and remove the heat-sink. Release the socket ZIF lever and swap out the processor with the new one. 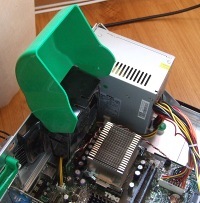 Replace the heat-sink, clips and shroud, close the case and restart the PC. During the boot phase, press F2 to go into the BIOS setup. The main page will provide immediate confirmation that the Celeron has been recognised. I bought a syringe of CPU heat-sink grease but I didn’t need it. The stock heat-sink had a thermally conductive sticky pad that stayed stuck to it instead of the processor. The pad was in good condition so I decided to reuse it to avoid trying to clean it off. The performance of Ubuntu Desktop 9.10 running on a Dell GX240 with a 1.6Ghz Intel Pentium 4 and 512MB RAM is surprisingly good. Upgrading the CPU to a 2.6Ghz Celeron has made the old PC feel a little faster for most GUI applications that I use. I suspect a higher performance GPU would make a more noticeable improvement. Since installing the faster processors, one of the GX240s will ‘freeze’ after a few hours of running. I suspect that the 2.6Ghz CPU is overheating as the stock heatsink is dependent on the shrouded case fan exhausting heat from the case. I am going to change the passive heatsink for a fan cooled version. I bought another two SL6VV processors for £2.49 each and I am now on the lookout for a pair of Socket 478 coolers. Despite the small setback due to passive cooling, this upgrade was worth doing considering how cheap it was. I recently installed BOINC on one of my Ubuntu machines but it wouldn’t do any work for the World Community Grid (WCG). The message log showed ‘Scheduler request failed: peer certificate cannot be authenticated with known CA certificates’. I tracked the problem down on the BOINC website. It is caused by a missing digital certificate that is required by WCG but not included with Ubuntu’s BOINC distribution. Fortunately, the fix is very simple. Just download the missing certificate , copy the file to /var/lib/boinc-client , then restart BOINC. I have a Brother MFC-660CN all-in-one network printer on our LAN and it has been performing admirably for nearly three years. I was so impressed with this printer that I bought a MFC-680CN for my parents and another for use at home. Each of the Windows PCs has the complete multifunction driver set installed and can print, FAX and scan over the network with ease. I would like to be able to do the same with the Ubuntu Desktops but I suspect that it is going to be a little trickier getting the network scanning and network FAX functions operational. This page is just concerned with getting network printing running. I have used CUPS before and have already decided that I am going to use an Ubuntu PC setup as a server on the LAN as a print server to share the printer with the other desktops. Fortunately, Brother has good driver support for Linux. I followed these instructions on their website but it is a little confusing in places as it references multiple Linux distributions. To make things easier for myself, I am summarizing the method for Ubuntu 9.10 here. Download and save to disk the ‘deb’ format of the LPR driver and the cupswrapper driver. Open a terminal on the Ubuntu ‘print server’ PC to type in the commands to install the drivers. I used “Applications”, “Accessories”, “Terminal” from the GUI. I downloaded the LPR and cupswrapper driver to the ‘Downloads’ folder in my home directory so I changed the current working directory to that folder. I had the following result confirming that the drivers were installed. Under ‘Queue Name’, click the name of the printer (MFC660CN). You will be prompted to login, use your usual Ubuntu credentials. Select ‘LPD/LPR Host or Printer’ and click Continue. For ‘Connection:’ enter lpd://printer/binary_p1 where printer is the hostname or IP address of the printer that the LPR and cupswrapper drivers will print to. Then click Continue. Enter a Description and Location. Share the printer by ticking the check box. Click Continue. The printer driver that you just installed should be selected. Click ‘Modify Printer’ to activate the changes. The ‘Administration’ button menu has a ‘Set Default Options’ selection. You can use this to change your paper type to A4 size. You should now have a working CUPS print server. I recently bought two used and abused Dell GX240 PCs for a software development project I am currently working on. I don’t have a spare LCD monitor to use with them at the moment but the guy that sold me the PCs also had some old CRTs that he wanted to get rid of. So, for an additional £3, a heavy 17″ CRT monitor is now on my desk. It takes up a lot of space, but for only £3 it’s a small sacrifice. Ubuntu Desktop 9.10 installed on the GX240 without issue. However, the maximum resolution displayed was 800×600. I knew from previous experience of the NEC 5FGe was that it could go higher. In fact, the maximum resolution is 1024×768. Not much by today’s standards, but a lot better than 800×600. The X-Window system from X.Org in Ubuntu is considered to be so good at doing device detection now that the traditional manually edited configuration file xorg.conf is no longer present when installed. This is great for most Flat Panel monitor users, but not that good for people using old fashioned display cards with CRT monitors. Fortunately, xorg.conf is still supported and it is possible to get old junk running at or near its best. It took a while searching for the info on various web sites but it was worth doing. My 5FGe is running at 1024×768 and is good enough to use to type this. As I know I will probably need to do this again someday, I thought it would be worthwhile documenting the process while it was still fresh in my mind. With Ubuntu Desktop running the GUI, press Ctrl+Alt+F1 together to switch to a character terminal interface. At the prompt, login with your Ubuntu user ID and password. When logged in your current working directory should be your home directory. At this point, you should have an xorg.conf.new file in your home directory. Copy this configuration file to the /etc/X11 directory. If you know what settings your display equipment needs in the xorg.conf file, now is the time to edit it to include them. You will need to know the ‘Modeline’ info for the display resolution. I chose to specify 1024×768 at 60hz refresh as that was a safe starting point. The GTF program can be used to generate a suitable Modeline. To make things easy, I redirected GTF’s output to append to xorg.conf . I have got used to using Nano for editing files on Ubuntu but you can use whatever editor you like as long as you achieve the same result. You must cut and paste the GTF output from the end of the file and insert it inside the Monitor section. These settings work for my NEC MultiSync 5FGe. Note that each Modeline is a single line in the file. The comment output from GTF doesn’t hurt if present with a leading #. BoardName "Rage 128 Pro Ultra TF"
Restart the X-Window system using your new xorg.conf by entering the following at the command prompt. Once the GUI restarted on my PC, I clicked ‘Restart’ just to be sure that the AGP card and monitor were initialised properly. Then I went to ‘System’, ‘Preferences’, ‘Display’ and found that Xorg had now detected that my monitor could run at 75Hz despite not stating a Modeline for it. I have left mine running at 75Hz and all seems to be well so far. I have been a long time fan of Linux and Unix in general since the early 1990’s. I have tried many Linux distributions over the years but found that I kept on coming back to Debian. Some time ago when Ubuntu was first gaining traction I built my first Linux desktop PC. Up until this time I had only used Linux for server applications and the odd X-Windows Network Console. It was good, but device support was still not as good as Microsoft’s and I didn’t take Ubuntu any further. About a year ago, I installed OpenSuse on an old laptop and was impressed that it actually worked without too much effort configuring it. I don’t know why, but for some reason I decided to try Ubuntu again and downloaded a copy of Ubuntu Desktop 9.10 . The old Dell Latitude D410 was the candidate for the install and I was completely stunned how well it went. So much so, that I have been using that old battered laptop more recently than my year old Vista powered Lenovo. Could this really be the desktop Linux distribution that pulls me away from using Microsoft products? I think so. My wife recently purchased a Samsung N140 netbook with 2GB of RAM and Windows 7 Starter. This thing is an unbearable slug of a computer with Windows 7 and I’m surprised that anyone, including my wife cannot resist the urge to throw it across the room. I decided to see if the OS on the N140 was really the problem. I downloaded Ubuntu Network Remix (UNR) and created a bootable 1GB USB stick with it. Using UNR of the stick without installing it on the hard drive it was clear that the N140 was actually quite a good machine with the right OS. The netbook was snatched back before I could convince my wife to wipe it’s hard drive of Windows 7 but the impression it made on me has been astounding. In the last few weeks I have resurrected three old PC’s that weren’t even that good on WinXP SP2. Each is now running Ubuntu with admirable performance. One by one, these old PCs will all become servers although I’m actually using Desktop 9.10 because the GUI tools are just so good. Yesterday, I bought two old Dell GX240 midi-towers for a project. These old PCs had Win2K originally installed with 512MB RAM and 20GB hard drives. They are both running Ubuntu Desktop 9.10 now and I’m using one of them to write this. If Garmin would produce a version of Mapsource that would run on Linux I would have no more need for a Windows PC. Ubuntu is truly outstanding. I’m glad I took the time to rediscover it.